At some point in time, you will need to export your finished projects from Cakewalk to burn standard Audio CDs. Our newest products (SONAR 7 and higher) now come with a built in burning application that allows you to export your tracks directly to the burning software. We will cover this process at the end of this article. For those of you who do not have the latest versions of SONAR (or if you use other burning software) we will cover the steps needed for a proper export. You will need to ensure that the numbers of the tracks you are bouncing are highlighted as well. You can either hold down Ctrl and click on the track numbers, or click, hold and drag down all of the track numbers. Keep in mind, any track that is not selected will not be heard in the final bounce. Another good technique to use is holding down the Alt key when you select an area of a track. You can also select areas of multiple tracks with this function. Make sure you are selecting only the area and audio tracks that you want to bounce. If you have MIDI tracks in your projects that are not using software DXi or VSTi, they must be bounced down to audio tracks. Click here for details on this: "Future MIDI to Audio Tip"
The latest versions of SONAR give you many options for the mixdown. You can choose whether or not to hear effects, automation, bus routing, etc.. Press F1 or the Help button for a detailed explanation on each of these parameters. In the latest versions of SONAR, you have the option to “Add to Audio CD Track List”. This automatically adds the WAV file to the built in Burning software included with SONAR Studio/Producer 7 and higher, as well as SONAR Home Studio 6 and higher. Note: This option will not become available unless the Format is set to “Wave” and the Sample Rate and Bit Depth are set to 44100/16bit. 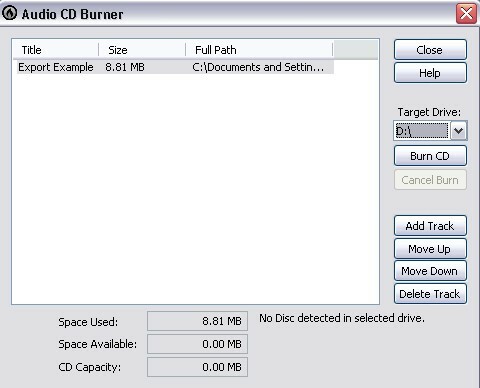 Now that the file is bounced, you must open the “Burn Audio CD” application from the Start Menu | All Programs | Cakewalk | SONAR. You will now see you’re your track is already on the list. Choose your Target CDRW drive, click “Burn” and it’s off to the races!